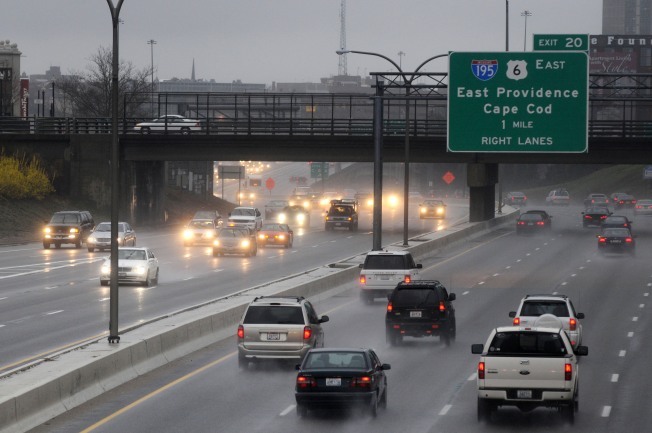 Traffic heading south along Interstate 95 into Providence. Officials have announced a new transit corridor meant to improve rush hour bus service in parts of Providence. The 1.4-mile "enhanced transit corridor" will connect the Providence train station to downtown, the Jewelry District and the hospital district. The corridor would offer bus service an average of every five minutes during peak hours. The project replaces a long-planned streetcar line, which died earlier this year. Sen. Jack Reed points out that the bus plan saves about $100 million in capital costs from not having to lay rails in the ground for a streetcar. The bus plan will be paid for in part by a $13 million federal grant that was awarded for the streetcar. The state will pay an additional $4 million for capital costs.